I'm always a sucker for those internet and magazine self-help articles on the theme of "What your car/phone/electronics/hair style/wardrobe says about you" or the 'How-To' pieces: How to Land the Man of Your Dreams, How to Look Ten Pounds Thinner in One Day, or even How to Look Great Naked. You know the ones. Catchy copy breathlessly gushes: "Your Audi screams fun and flirty! You're a go-getting jet-setting trend setter yearning for the wanderlust lifestyle! You were born to live on the other side of the pond. In your ideal life, Fridays would find you on your way to a rendezvous with your Italian lover!" Now, as a regular reader of these articles, the one thing I've noticed is that they never seem to reference my particular car or phone or electronics. I'm not sure why but it irritates me beyond belief. I can only wonder, if they wrote about me, what would they say? What Your Car Says About You: Your 2005 Toyota Corolla fairly screams Cheap Car! But the fact that this one actually has automatic windows says it is a huge step up from your Jetta. You were truly born without the car gene! Still, this is the first car you've ever owned that your husband doesn't tell people belongs to the cleaning lady. Next time, go wild and crazy and get a Prius! What Your Cell Phone Says About You: Like your car, it's says Cheap! Insanely cheap! It doesn't even have a camera! The fact that it is a pre-paid minutes phone means it doesn't have internet either! It also fairly shouts, "I have no idea how to text! In fact, I'm not totally sure how to answer it!" When your two-year-old granddaughter watches Yo Gabba Gabba on her iPhone, which she can operate herself, you ask, "What's that thing called?" How to Look Ten Pounds Thinner in One Day: Photoshop, Baby! Heck, go for fifty! What Your Wardrobe Says About You: You have a wardrobe? Did you age out of contention for "What Not To Wear"? Giving away the iron ten years ago was a great feminist statement: you're not about to wear anything that isn't wash and wear. But eventually even wash and wear wears out! Yes, it really does! Are you going for Bag Lady Chic? What Your House Plants Say About You: Is it any accident you only have five house plants left? And they're on probation? Your philosophy is: How expensive is a friggin' golden pothos anyway? If it needs watering more than once a week, it's not happening at your house. Survival of the fittest! You've spent your entire adult life taking care of kids, husbands, pets and plants. Can't let the first three crump (however tempting) but the second the horticulturals make a single demand, they're compost! Enough already! How to Look Great Naked: Short of losing sixty pounds and being reincarnated as a supermodel, there is no way on God's green earth that you are going to look great naked! Or even OK naked! That ship has like totally sailed! Or in your case sunk! 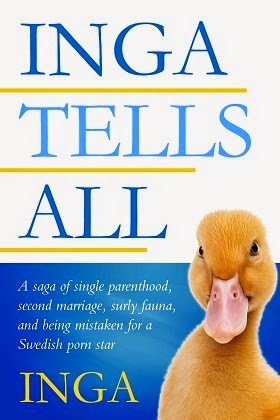 Sorry, Inga, that article was intended for people for whom there is actually hope! Can't believe you even read it! The link you were looking for was: "How to make sure people never see you naked." OK, I think I'm officially sorry I asked.